Driving across the countryside is not an efficient use of time while traveling, but it certainly is a beautiful way to travel. And where we’re going–the backroads work just fine. We’re on our way to other hilltowns, before our final destination tonight of Pienza. Above is Orvieto, from afar (through a haze, but it is apparent how “on a hill” it is). We both decided we could live in that house on the hill if we had sacks of money. But, oh, what a beautiful location. After traveling for a length of time, we arrive at the bottom of the hill of the town of Todi, in Umbria. This little church is the Santa Maria della Consolazione, built between 1508-1607. Yes, that’s 100 years. It’s one of those brilliant little Renaissance churches based on a Greek cross. There’s some thinking that it was built to a plan by Bramante. I’m always impressed with the architecture of that time, as it seems there’s not a hair out of place on these churches, and they are so symmetrial and ordered. If ever your life was crazy-time, you’d want to come and pray in a church like this. Here’s a map of Todi for orientation. Many hilltowns have a long street down the middle, with everything branching off it. This long street often leads to the main plaza and a church. We drive up a little further, park below this church, the San Fortunato (built 1292-1462, according to our guidebook), obviously missing the upper part of its facade. I liked the criss-crossing steps on the hill, visible on the map above, to the left of the main part of the town. Todi has a lot of curving streets bordered by buildings. The shadows leading to the light are a typical scene, with flowers in the window box. View from through the Duomo’s front doors. View from the Duomo doorway into the Piazza del Popolo, which was built in the 13th century on the site of a Roman temple to Apollos. I liked its spare feeling–not a lot of ornamentation. If I lived here, I could eat every night on that little balcony. There’s a lot times when traveling here that we would see a picturesque place like this, and wish for a few minutes that we could enjoy their style of living. But how often would the children and grandchildren be able to see us if we lived across the ocean? Our family has a pull that no beautiful house can match. Giribaldi Plaza. This man was a folk hero, soldier, member of Itay’s parliament and apparently responsible (or contributed heavily) to the unification of Italy. Didn’t know any of this when I saw the statue–just liked his outfit and his hat, and the fact that the parked cars were an interesting juxtiposition against his rakish stance. He traveled all over the world, married a Brazilian woman, and even came to the States to try and raise money for a ship. Lovely square tower, so typical of these towns. I assume all the dots next to the windows once held shutters. This was on one side of Giribaldi Plaza. We were thinking about our next meal (lunch) and moving on to try and find a cousin to our Derutan plates hanging on the walls back in our kitchen, so we buy some prosciutto to go with the rolls we had from Orvieto, along with one tomato and two yellow plums. We stop in Deruta and eat our lunch in the car, then try to find the pottery. First stop–not the style, but beautiful. The town appears to be closed for the lunch hour–it’s all deserted. I’m about to give up home, but Dave spots an open door. We go in. This is when I know Dave has ultimate tourist karma, because it’s the shop! I’d taken pictures of our plates before leaving home and the owner identifies them as his. He confirms that he sells to a place in Laguna Beach, so we know it’s the right place. We take a long time, but finally choose salad-sized plates to take home. Here he is putting the wire on the back for hanging. He then invites us in to see the artists at work in the workshop. Were you expecting Gepetto? It’s lunchtime he says (he speaks English), so a lot of them are at home. It was interesting to me how they used one hand to support the other as they painted. While we’re there, another tour guide with only three women comes into the shop, and I overhear her say this is the place to come for high quality pottery from Deruta. After paying for our plates, we find a gelato shop at the end of town and celebrate by sharing. We head on the highway toward Perugia, then veer off to Assisi. We can see it from the motorway, high up on a hill, and we begin the climb up to the top (in our car). Just to the left of that green patch on right (on the map above) is a car park–a garage with LOTS of parking. This is at the top of the hill, so we begin to wend our way down to the Basilica. This plaza is the first one we enter at the top of the hill, with its traditional square tower. A friar on his way past the gelateria. A favorite shot when I can get it: through an archway into the valley below. Old frescoes (above and below) above interesting doorways. A combo drive/walk street. Or else the paved sidewalks are for shopping carts and baby buggies. Aqueduct of Assisi: water supply. Dave in front of a building that looks held together with rods and end posts, but it has a variety of windows, probably from different eras, er–centuries. Just around the bend from this is the Basilica. This was the one that was so heavily damaged in the earthquakes in 1997. I remember seeing all the rubble of the collapsed tower, but we came so I could see the frescoes by Giotto, which are along the walls of the main church. It was the campanille to the left that was so heavily damaged (I think). PAX on the lawn in front of the basilica. We took the tour–Reliquary, Tom, Lower Nave, Upper Nave–but no photos allowed, ending up in the gift shop, where there were no decent books on Giotto’s frescoes. Okay to take photos of the courtyard, though, just outside the gift shop. We head back inside the church to admire the art. Here’s some sampling from the web. The main part of the church. Given that I’ll probably never get into Scrovegni Chapel, these were next best thing. We linger a long time, enjoying all the artwork, walking up and down, but mostly sitting, amazed at these frescoes, still intact from the 13th century. They portray the life cycle of St. Francis. Above, he eschews rich clothing and his titles so help the poor and needy. Below “Do not touch me,” as he greets Christ. Head to this website to see more. Back outside, we take more photos. The friary? I like the brickwork. Lower level, I guess where the tour busses arrive and drop off the tourists. We head back up the street, spotting a nun. Silly to take photos, I suppose, but it’s not something I’ll see often in my hometown. Yet, it’s evident it is part of life here in Assisi. This reminds me of a balcony where a Juliet might talk to her Romeo. On that day in Assisi, rain drops were falling–spitting, actually–but no rain. Thirsty, we buy a 2-euro bottle of water and drain it. That’s one of the things about traveling, you learn not to take easy access to a drink for granted. I assume these are coats of arms affixed to the wall. Another balcony on another square tower. We’re off to Pienza to our hotel. We found this Hotel–Piccolo Hotel La Valle–on the web, where it was part of a traveler’s diary, then confirmed it was a good hotel on Venere.com, a cousin to our domestic Trip Advisor. It was at the edge of the town, and when we opened our windows we saw the countryside below. Requisite photo of bathroom. Love the checkboard tiles. We went to dinner at a restaurant recommended by the hotel desk: Da Fiorella. It is a very small place, with an upstairs loft-like area overlooking the main floor. In the front is a fennel, pepper, carrot and raddichio salad. Dave had grilled eggplant with cheese. And in the center–heaven–in the form of lightly dressed white beans with onions. Dessert: panna cotta with berry sauce and berries. We shared it–delish! We arrive in Paris; it was tight a connection on Alitalia until the flight was delayed by two hours and we spent too much money on airport food for lunch, but not by choice. Welcome to travel. We board and land in Rome, ready for our adventure. First adventure: get the rental car, by walking through lots of tubular walkways like this one. The Slow Travel website had a really good description of how to find these rental car counters, so I knew it was a long way away from our gate. Into the car and out on the freeway. Driving in a car around Rome was unusual, because like most tourists, I’d only ever traveled the downtown city center. It was interesting to see where Romans lived (high rises) and also interesting to see these glass walls on the freeway. The first time anywhere I think the sense of discovery runs very high and anything different or new is interesting, or at least worth taking a photo of. Even dumb things like this tanker with interesting stars on the back of it. Or beautiful things like these fields of sunflowers. We drove to Orvieto and looked for a place to park our car. We drove around the top of the city (remember this is on a hilltown) three times, before finding a car park. Then find our way to the hotel. Dave checks us in. 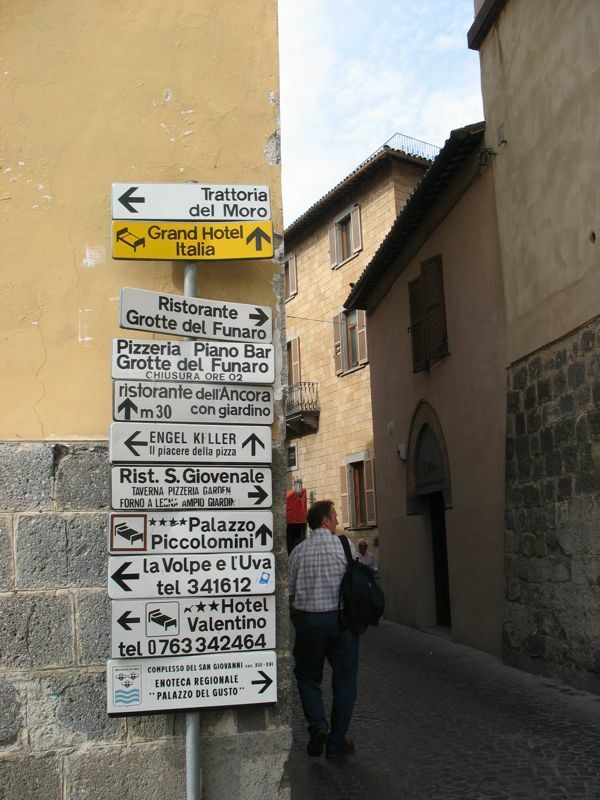 The name of the hotel is Albergo (Hotel) Fillippeschi and it’s on Via Filippeschi 19. The bedroom. It overlooked a fairly quiet street. The bathroom. Stuff stowed, we head out. As usual our time zones are scrambled, so it’s stroll for a while until we feel we can do some dinner–usually later in these hilltowns. We head for the Duomo, as we’ve heard it’s best to see it in the setting sun. This isn’t a huge town, so we just meander our way over. We come upon the plaza, framed by the side streets. The striped construction is so interesting–bands of dark and then light flagstone, according to Wikipedia. The sun’s beginning to glint off the gold glass tiles in the mosaics. We couldn’t take our eyes off of it. For a comprehensive discussion of what is just touched on here, *this* website has a lot of great details about the cathedral. We’re not the only ones who think this sight is worth something. A row of older men sit across the plaza from the duomo chatting away. From the looks of them, it’s a nightly occurrence in summer, I’d guess. And on the other side, the distaff side of the town gathers to talk over their day. We’re back to fascination with this cathedral. Apparently there are three major cathedrals in this region: Sienna, Florence and Orvieto, but this one gets little attention, as compared to the others. Certainly the city around it is not as compelling, and perhaps that’s why–size of town. This is literally the top of a hill, and it’s not very big, whereas the others have spread out more. But we find the front of this church, and its carvings entrancing, taking photo after photo (this is where a telephoto lens would have come in handy). I suppose this one is the Creation, although I don’t know who the standing figures are on the left. Spiraling bands of mosaic up the side pillars. I’m thinking quilt patterns! It’s a loopy kind of spiral, not even and measured. The pillars near the front door. You can see the loopiness in that one pillar more clearly. Reaching out over the edge of the facade in the upper right is a bronze sculpture: the eagle representing John in the New Testament. Above the huge front doorways are a rose window and another triangular mosaic. This is taken from the alley across the street. The plaza is not that large–sort of like Florence’s Duomo–hemmed in by buildings. Remember that there is not a lot of real estate up here on this hill–not like Venice, which has a grand plaza in front of its cathedral. Apparently the flying buttresses (seen at the far end of this picture–the curving line) were built to try and help with the distribution of weight. Later they were found out to be pretty much useless. This cathedral too over 300 years to build, so I’m sure there were a lot of committees working on this one. A side door. Love the green lintel. These stripes I find, are quite striking, and highlight the architecture of this building. Strong bold stripes that have lacy filigree bands create another kind of contrast. We think we’re hungry now and head for dinner. Three courses, and this is the first. It’s like a taste of everything. Pardon the half-eaten meals. Sometimes we forget to take a picture at the beginning. These gnocchi were the best I’ve every eaten, anywhere. Somehow we got our wires crossed and they brought the cheese course. I thought it would like 3 pieces, but it was a board with about 13 different kinds of cheese. I told them I’d pay for it, but there was no way I was going to eat it. Dave had dessert, though, and this is how it was served: a rolling trolley with clear covers over a variety of different desserts. I had some fresh berries, and Dave chose this baked dessert, but I can’t remember what it was, or what the name of the restaurant was. It was sort of kitty-corner from the Duomo, on our hotel side. And this is what we saw when we came out after dinner. I’m always struck by the color of the skies in Europe–such rich colors, unlike our insipid blah of Los Angeles area. I suppose if we were on a hill somewhere, away from smog, lights and haze, we might actually get a sky like this. Nah. The next morning we, with out screwed up time zones, are up way before dawn, shower and dress and try to go for a walk. Except they’ve locked the hotel front door and no one is at the desk. Okay–what if there were a fire? How would we get out now? We explore a little, and back in the bar is a little door opens that leads to a little alley. We’re out and can’t get back in until someone comes to man the desk. This is the hotel; the woman is standing in the doorway and our room is above her, shutters closed. A different kind of light shines on the buildings this morning, with different facades and buildings illuminated. I like the two small windows by the central window, and the bas relief over the deep doorway. This is supposedly the oldest building (after the cathedral). The crenelation on that roof is quite interesting. I love that these buildings have art on the exterior, with a very elegant frame. I’m going to paint my doorway in bands, just like these. Do you suppose they scavenged them from when the cathedral was being built? Tthey are across the side plaza. Coats of arms built into the building. We’d seen this clock last night (it faces the side of the cathedral, next to the shop with the interesting black and white doorways). We think the top contraption is a mechanical clock. There is more to this town than the cathedral and we go exploring. A perfect little Madonna and son tile embedded above a doorway. Senso Unico=One Way. That’s why we traveled around the town three times the night before trying to find a place to park. Everytime we’d get close, one of these signs would direct us another direction. Close-up of the little patio in the picture above. I’m pretty fixated on mailboxes when I travel. Someday I’ll do a post on nothing but mailboxes. This little church wasn’t open, otherwise we’d have gone inside. It is still quite early in the morning. They do doorways really well in Italy. The morning sun is beginning to bring the Italian colors alive, along with fake sunflowers blooming on a balcony above us. The angles: up, down, slant, rounded, framed by a small alleyway. Doesn’t the mossy texture on this church invite touch? And that cross has its own tufts of grass–or lavender–growing up there. These pictures are taken overlooking the surrounding countryside. Now we’re back onto our street and are thinking–maybe breakfast? We wanted to get a start this morning toward Pienza and visit some more hilltowns. I love this balcony of flowers, but could never replicate them in our desert heat. Even the arbor is well-defined in vining tendrils. After breakfast, one last view from our hotel room, as people are starting their day. We leave our luggage, and decide to try and see the interior of the cathedral. I’m always surprised when an ornate exterior leads to an empty interior–much like the cathedral in Florence, I think. The Rose window from the inside. I suppose if we’d been on a tour, they would have turned on all the lights to illuminate ceilings. I’ve seen some of these photos on the web, but we take our sights as they come to us. Frescos in the side chapel, dating from the Renaissance, about the 1300s according to some websites. Walking down another street, this is the view from below of the backside of the cathedral. And back around the other side. We know the car’s meter is about up, so we head over to the car park plaza. I’m a sucker for a good cobblestone alley; this is walking away from the Duomo. It’s that interesting building again. With a church across and a woman selling herbs and vegetables under her green striped umbrella. Car’s packed, and we’re ready to go.